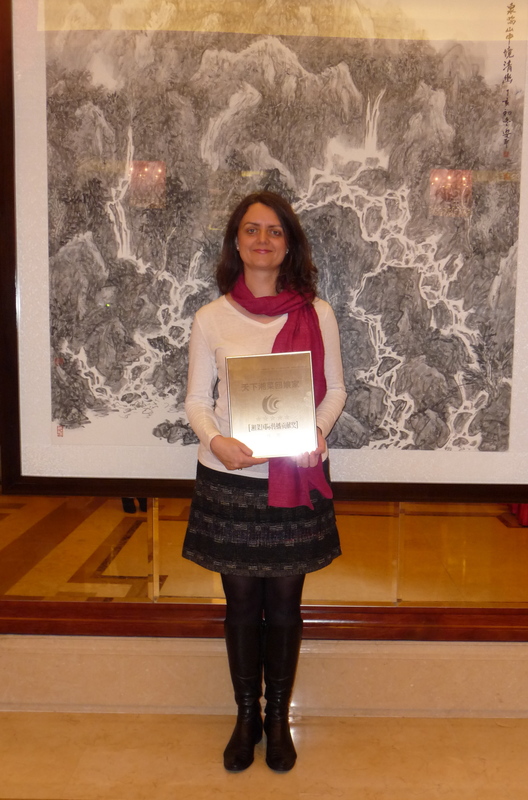 At the conference today I received a Hunanese government award for contributions to the internationalisation of Hunan cuisine! It was worth getting up at what seemed like ungodly hour, after a jetlagged and somewhat sleepless night. The hall was packed with about 300 delegates, and I was the only Westerner – a weird throwback to my early days in China. Awards in the international category were also given to my friend and colleague, Bashan/Barshu owner Shao Wei; Peng Tieh-cheng, son of Peng Chang-kuei; and Susur Lee. And there were also awards for local chefs and restaurants. Shao Wei and I spent the rest of the morning doing interviews with local media (I think we may be on TV tonight! ), and then I had to give a brief talk after lunch. A bit nightmarish having to speak in Chinese before such a crowd, but it seemed to go OK, and I managed to entertain them with tales of persuading Westerners to love eating preserved duck eggs and rubbery things! objects that was unearthed in three aristocratic tombs on the outskirts of Changsha in the 1970s: one of the richest archaeological sites in China. 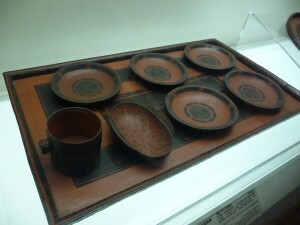 It is particularly interesting to me because the tombs, which date back to the Han Dynasty, about two thousand years ago, contained a treasure trove of foodstuffs and records (inscribed on bamboo slips) of the cooking of the time, along with beautiful red-and-black lacquerware, much of it used for storing and serving food. Apart from the food-related remains, there are models of singers, dancers, a make-up box, a chess set, models of musical instruments, and textiles in a remarkable state of preservation. If you’re interested in this sort of thing, it’s worth making a trip to Changsha just to see the museum. Congratulations. You certainly deserved it. Your blog is one of my favorites and I check it almost on a daily basis for new entries. I have recommended your site and writings to both my Chineses and non-Chineses friends. Your insisights to both Chinese food and non-food cultures are spot-on and accurate. Congratulations Fuchsia! I love seeing a slightly Western delve deep into Chinese Cuisine. I’ve just finished reading “Shark’s Fin and Sichuan Pepper” and I absolutely loved it – I’ve already recommended it to half a dozen friends! This is such an interesting read… I remember attending your Sichuanese masterclass at the Sydney Int’l Food Festival last year – it’s great to get more context from your book. Congratulations Fuchsia! As always I wished I could have been there. Hoping to catch up in London sometime this winter. That’s fantastic news Fuchsia, very well deserved. Already looking forward to the next Ba Shan visit. Hope you’re picking up lots of ideas out there? Congratulations on this award! I am a huge fan and have all your books. Your work first came to my attention as I researched Hunanese cooking in order to prepare “authentic” meals for our daughter who was born in Changsha. Thank you for bringing great Sichuan and Hunan cuisine to so many outside China and making it possible for us to share a little of our daughter’s heritage. Your deserve the award and I only wish I knew who you were since I too there is Hunan with you. But I was glad I had a quick word with you after the dinner on Wednesday when I said your Chinese was better then mine. When my host told me on the plane flight back to Beijing prior to our flight the States who you I had wish I had time to talk to you about Chinese since I have used you books as a starting point to Hunan and Sichuan style cooking. I am American born Chinese so you are right about being the only true Western there but there was a group of Chinese American there. Already two of my cooking partners are giving me a back time on missing a chance to talk to you together we have all your books. Many congratulations on your award. I loved but did not really understand chinese food until I found your books. They have inspired me to delve into the foundations of chinese cuisine by fermenting soy sauce, rice wine, preserving chiles, and all in all transforming my kitchen into a mad scientist’s lab more or less. I came across your blog from another blog. Congratulations on your award. I was originally from Sichuan but I had opportunities to travel to Wu Han, Hunan a few times when I was a kid. I loved the food from Wu Han but am sad that I can’t find a quality Hunanese restaurant in where I live now. I’ll be sure to pick up some of your cook books so I can cook it in my own kitchen.